Waffle bath robe in 67% cotton/33% poly. 48" length with a 17" sleeve length. Inside hanger loop.White and ecru. Piping in black, navy or royal. XXL and 4XL options. 100% combed cotton velour with mulfi-needle stitching around the front pockets and cuffs. Double belt loops for adjustable belt height. Inside hanger loop. 48" length. 100% combed cotton velour with roll up collar and cuffs. Double belt loops for adjustable belt height. Inside hanger loop. 52" length. XXL and 4XL options. 100% combed cotton terry robe with multi-needle stitching around the front pockets and cuffs. Double belt loops for adjustable belt height. Inside hanger loop. 48" length. 16 oz. Large Diamond Waffle Robe comes comes in 67% Cotton, 33% Poly. 48" length with a 17" sleeve length. Inside hanger loop. Piping available. XXL option. 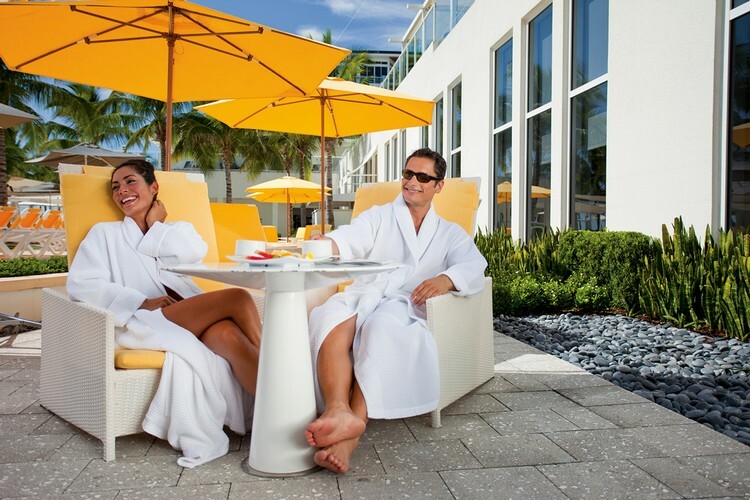 Microfiber bath robe in white with 85% polyester/15% nylon shell and 80% poly/20% cotton soft French terry knit lining. Shawl collar with roll up cuffs. 52" length with 22" sleeve length. Inside hanger loops. Belt loops along side and center back. XXL and 4XL options. 100% combed cotton terry robe with mulfi-needle stitching around the front pockets and cuffs. Double belt loops for adjustable belt height. Inside hanger loop. 48" length. 12 oz. weight. XXL and 4XL options. 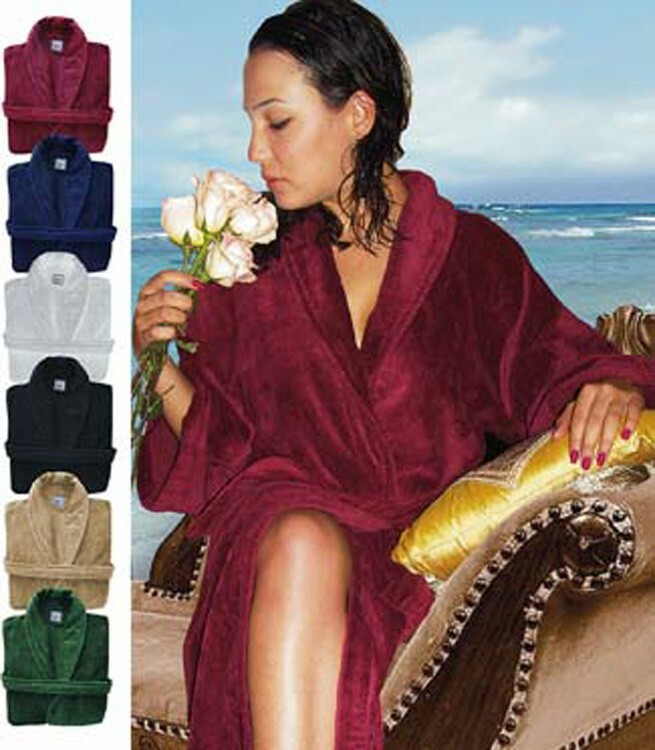 100% combed cotton velour robe with multi-needle stitching around the front pockets and cuffs. Double belt loops for adjustable belt height. Inside hanger loop. 48" length. XXL and 4XL options. Knit waffle robes are characterized by their modal fibers which have unique softness. 45% cotton/45% modal/10% polyester. Piped in self color around the front collar and cuffs. 52" in length. Inside hanger loop. White and ecru. 100% combed cotton velour in a 1" vertical stripe pattern, 52" length with a roll up cuff. Double belt loop for belt height adjustment. Inside hanger loop. 14 oz. XXL option. Waffle bathrobe with shawl collar is 67% Cotton, 33% poly, unlined and piped in navy or white piping around front, pockets and cuffs. 52" length with a 22" sleeve length with roll up collar and cuffs. Inside hanger loop. 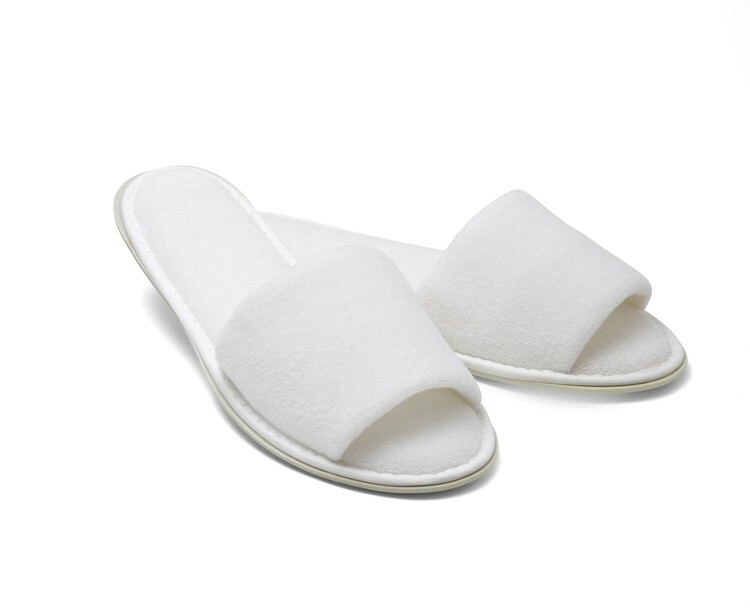 Cotton/poly blend slippers have a non skid PVC sole with extra foam in the vamp and bottom for extra comfort. Side velcro opens for sizing and comfort. Robes from Turkey are recognized as the finest in the world. Here's a high-quality Turkish terry velour robe at a very affordable price. Our gift packaging options let you build a presentation that will be remembered for a long time. Double pockets and self belt. Embroidered or individually monogrammed. White only. Unisex. One size fits most. 48" long. Embroidered or individually monogrammed. 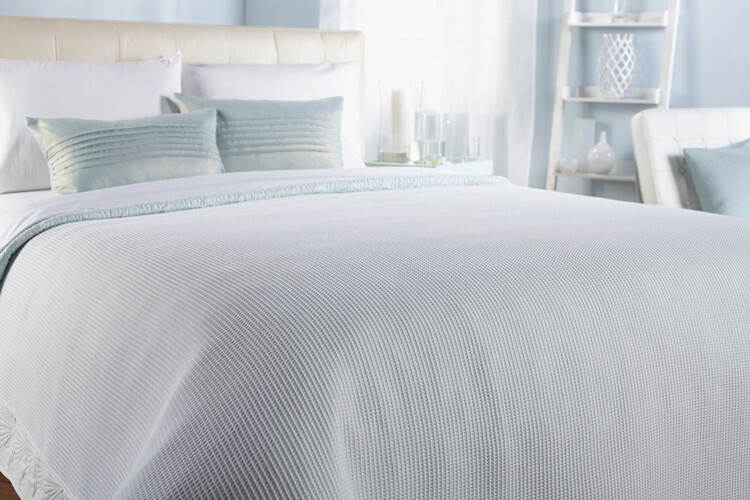 Waffle blanket is 67% cotton/33% poly weave in king size. Great for spas, salons, hotels, throws, extra blanket and warm climates. White and ecru. 100% cotton velour spa wraps have snaps for sizing closure plus elastic back for comfort. Men's wraps are a 24" length. Ultra soft, plush and luxurious Micro Terry bathrobe is 48" in length, 17" sleeve length with double belt loops for height adjustment and inside hanger loop. White and ecru. 100% combed cotton velour or terry with roll up collar and cuffs. Double belt loops for adjustable belt height. Inside hanger loop. 52" length. Large diamond pattern waffle bath robe is 67% cotton/33% poly blend with shawl collar, 52" length, 22" sleeve length, double belt loops and inside hanger loop. Piping available for roll up collar and cuffs. Waffle men's spa wrap around is 67% Cotton 33% polyester waffle. Wraps have snaps for a closure with elastic back. Men's wraps are a 24" length. White and ecru. Kids robe for after bath, pool and beach. 100% combed cotton fabric with hanger loop, belt loops and pockets. 19" length. Sized for kids infant - 2 years. White. Our most versatile robe is the epitome of comfort. Contemporary design appeals to younger generations. Flexible material makes it ideal for water sports teams, or just for around-the-house leisure. Double-layered sweatshirt fabric, long sleeves with fitted cuffs, two patch pockets, double belt loops and self-belt. Made of 80% cotton / 20% polyester fabric. 100% cotton velour spa wrap for women have snaps for sizing and closure and elastic back for comfort. Women's wraps are 32" length. White and ecru. 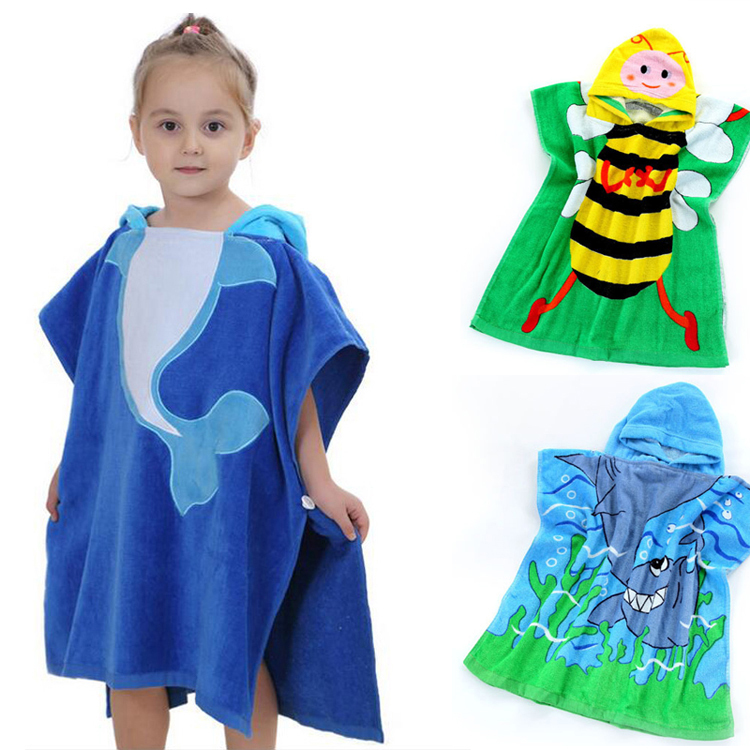 Beach towels for kids is made of 100% cotton which made it comfortable when wearing as a cape with hoodie top. multi-functional, can be used as bathrobe, blanket, cloak, wrap and towel. Shawl bath robe made of terry cotton. Minimum purchase: 1 case (4 pieces/case). Weight is 3.5 lbs. each. 45" x 60", 100% polyester blend that repels sand. Dries quickly. Allergen-free. Rolls up easily, with black woven wrap with Velcro. 5" wide wrap can also be embroidered - maximum size 3.5"W x 2"H.
100% combed cotton velour with mulfi-needle stitching around the front pockets and cuffs. Double belt loops for adjustable belt height. Inside hanger loop. 48" length. XXL option. You won't believe how soft and comfortable this robe feels. And you won't believe the low price, either. Plush and absorbent, once you try it on, you'll want to wear it all day. Double pockets and self belt. White only. Unisex. One size fits most. 48" long. Embroidered or individually monogrammed.